Summer here and the time is right.. oh wait that is a song.. sorry.. Summer is officially almost here but in some parts of the country it is in full bloom. I have heard temps in the 100's already. Here in the midwest we are still in the funky weather. One day 80's the next 50's. One thing that doesn't change is the need for a quick healthy breakfast. So why not grab a smoothie? Do you know how many combinations you can make? One of my favorites I used to make was a protein shake. It's a great shake to have post workout and it's simple. One scoop protein poweder, 1/2 bananna, and 1T peanut butter. It's awesome! 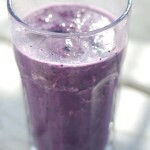 Really any smoothie can be turned into a protein shake. Try a weird combination you may never think of trying. How about a veggie smoothie? Most of these recipes can be made ahead of time so you have an instant quick healthy breakfast in the morning. Yes folks you can have your cake and drink it too!